Posted at: 3/25/2010 12:28:00 AM . 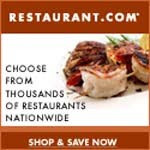 Until March 31, 2010, you can enter the code COOK at restaurant.com for 80% off their already discounted gift certificates. Even better, eBates offers 15% back on restaurant.com purchases.